MicroISV's, It's Time to Sell More Software! Please note: Startup Sites that Sell! 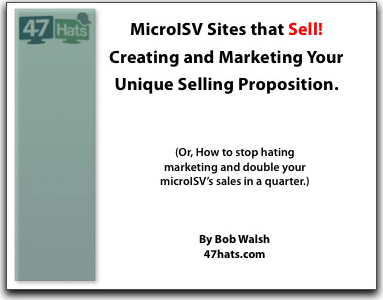 is a re-release of Bob Walsh's popular MicroISV sites that Sell! ebook with much better formatting for iPads, tablets and printing! Here's the scenario: you're a small, independent software developer that against all the odds has created a commercial desktop app or web service, working long, exhausting hours to create something you can sell. But you're not a marketing person, a suit, or one of those people who somehow makes sales happen. Guess what? Not a problem. Startup Sites that Sell! was written to demystify one of the strongest, fairest, and best marketing strategies that reputable software companies can use to substantially increase their sales. It's a proven, deployable, debugged, and robust way of helping your prospective customers comprehend the value of whatever it is you have to sell. Section I: Why microISVs fail to sell. -Mistake 1: Where’s your Hook? -Mistake 3: Too many words. -Mistake 4: Google AdSense on your site. -Mistake 5: The Invisible Man. -Mistake 6: Customer as Circus Animal. Section II: The USP pattern. -A Reason to Act Now. Section III: Successful USP examples. Section IV: Creating your USP. -Exercise 1: Defining your Primary Customer. -Exercise 2: Defining your Relevant Value. -Exercise 4: Creating your Hook. Section V: USP Deployment Checklist. -The USP Web Site Deployment Checklist. -Conclusion: It’s time for action. Get all this at a discounted price! Kevin Lintner Really? The kind of "follow my formula to success" ebook that populates the spam folder of my email account? Way to lower the bar. Gonzo Well, it's really unusual (though appreciated) seeing ebooks (or anything other than software) here in BDJ. PS: to BDJ Admins - It would be a great idea to specify in the title (or near it) when the offer is not a software app. Bob Walsh Kevin - Perhaps you might take a look at some of the comments I received on the first edition. The only formula I'm offering is a way for people more comfortable with API's that market segmentation to define their message for prospective customers. It has the advantage of working, but its up to you. Gonzo - Thanks for the comment! I think it would make sense for BDJ to add something to ebook they decide to promote. David Wahl How many pages? Sergiy Tytarenko Is this book different from "MicroISV sites that sell", because that's where the link above goes and the price is $19.95, not $24.95? Not substantially. Startup Sites that Sell! is a re-release of MicroISV sites that Sell! with much better formatting for iPads, tablets and printing. If you are like many people, even the thought of delivering a speech in front of an audience will get your palms sweating.